This article is about the English actor. For other actors with similar names, see John Wood (disambiguation). John Wood, CBE (5 July 1930 – 6 August 2011) was an English actor noted for his performances in Shakespeare and for his long association with Tom Stoppard. John Wood was born in Derbyshire, England, and was educated at Bedford School. He did his national service as a lieutenant with the Royal Artillery, where he was invalided out after being accidentally shot in the back and later almost killed in a Jeep accident. He read law at Jesus College, Oxford. He was president of the Oxford University Dramatic Society. He had seen Sir John Gielgud as Angelo in Peter Brook's 1950 Stratford-upon-Avon production of Measure for Measure, "and suddenly knew what I wanted to do". He played Malvolio – "looking as lean, lanky and statuesque as Don Quixote," said the Oxford Mail – in a Mansfield College gardens production of Twelfth Night with Maggie Smith as Viola. He directed and starred in a student production of Richard III and invited one of the leading critics of the day, Harold Hobson, to the performance, telling Hobson that he would be "wanting in his duties" to ignore a Richard III that was "finer than Olivier’s". Out of curiosity, Hobson went to the performance, and reported that he had seen "something not to be missed"; the young actor had a "sardonic, amused condescension and visible superiority complex", and the critic foresaw "a considerable future". Wood graduated from Oxford in 1953. In 1954 he joined the Old Vic company playing a string of small roles over two years as the company staged the complete First Folio of Shakespeare plays. Wood dismissively described these roles as "the cheapest way of getting a Shakespearean costume on stage", although Kenneth Tynan thought his Lennox to Paul Rogers' Macbeth "cut like a razor through the stubble of fustian". Other roles included Bushy and Exton in Richard II, Sir Oliver Martext in As You Like It, Pistol in The Merry Wives of Windsor and Helenus in Troilus and Cressida in a company that also included many future famous actors. Wood made his West End debut as Don Quixote in Peter Hall's staging of Tennessee Williams's Camino Real (Phoenix, 1957). He then joined George Devine's English Stage Company, which was about to change the course of new British drama at the Royal Court. Wood read scripts, co-directed a Sunday production, and appeared in Nigel Dennis's The Making of Moo (1957). Wood returned to the West End in Peter Hall's production of The Brouhaha (Aldwych, 1958), in which he had only a small part; but as Peter Sellers's understudy he played a leading role 15 times. Despairing of a successful career, he rejected several offers from Hall in the early 1960s to join the newly formed Royal Shakespeare Company, electing instead to appear on television, in A Tale of Two Cities and Barnaby Rudge, among other productions. He returned to the West End in 1961 as Henry Albertson in the whimsical off-Broadway musical The Fantasticks, at the Apollo. Most of the next six years were spent in a variety of films and TV programmes. Three of his last TV performances were in short plays written by Tom Stoppard for "Thirty Minute Theatre": "Teeth" (February 1967) and "Another Moon Called Earth" (28 June 1967), and an Avengers episode, "The Bird Who Knew Too Much" (February 1967). His association with Stoppard brought Wood back to the stage in his New York debut. Wood played Guildenstern in the Broadway premiere of Stoppard's Rosencrantz and Guildenstern Are Dead. Wood's performance earned a Tony nomination as Guildenstern. While in America he starred in two Jerry Lewis films, One More Time and Which Way to the Front?. Wood recalled of Lewis: "He taught me never to be afraid to take a risk. There was only one response, laughter, to the most horrific, cruel thing you can imagine." He returned to England to play Frederick the Great in Romulus Linney's The Sorrows of Frederick at the Birmingham Rep in 1970. The same year he had his first real London success in Harold Pinter's revival of James Joyce's Exiles, "uncover(ing) characteristic layers of meaning hidden within the text". His performance as Richard Rowan, a self-tortured author with a need to be deceived by his wife, was "lugubrious and brooding, sudden and snappish, a reptile with a quick, dangerous tongue". His performance won the Bancroft Gold Medal 1970 award for Most Promising Actor. Wood joined the Royal Shakespeare Company at the Aldwych Theatre in 1971 under Peter Hall, and where he remained for several seasons. In 1971 he played Yakov Bardin in Maxim Gorky's Enemies, “far gone in booze, self-loathing and despair". His 1972 performance as Brutus in Julius Caesar was his breakthrough performance, leaner and hungrier than Cassius, "with weary disdain", "superbly realising that Brutus is a figure close to Hamlet". At the RSC he also played Sir Fopling Flutter in George Etherege's Restoration comedy The Man of Mode, Mark in Jean Genet's The Balcony, and a narcissistic Saturninus in Titus Andronicus. After the two Roman plays, Wood was acclaimed "the most intellectually exciting actor in Britain" by Sheridan Morley. He made a "spindly, lecherous and slightly manic husband" in John Mortimer's Collaborators (Garrick, 1973) alongside Glenda Jackson. Returning to the RSC he took the title role in William Gillette's 1899 drama Sherlock Holmes. The RSC took the production to Broadway in late 1974, attracting his second Tony nomination in 1975. It was the start of period of seven years alternating between London and New York City. Before transferring to America, Wood took on the role of the diplomat Henry Carr in the 1974 premiere of Tom Stoppard's Travesties. Stoppard wrote the part of Carr specifically for Wood, meaning Trevor Nunn was able to secure Travesties for the RSC. As Carr, Wood alternated between the dual roles of a querulous geriatric and his younger snobbish self remembering his encounters with James Joyce, Tristan Tzara and Lenin in 1917 Zurich. Wood was awarded the Evening Standard Best Actor award. Travesties transferred to Broadway at the Ethel Barrymore Theater in 1975, and Wood won a Tony Award in 1976 and also a Drama Desk Award for his performance. At the RSC in 1976 with Tom Conti, Bob Hoskins, T.P. McKenna and Zoe Wannamaker, he took the lead, General Bugoyne, in George Bernard Shaw's The Devil's Disciple and the title role in "the ideal midlife crisis play", as Chekhov's Ivanov. In summer 1977 he took the role of the lunatic Ivanov, who imagines he owns an orchestra, in Tom Stoppard and André Previn's political oratorio Every Good Boy Deserves Favour, directed by Trevor Nunn at the Royal Festival Hall. In autumn 1977 he played the title role in a Broadway production of Tartuffe (translated by Richard Wilbur) at Circle in the Square Theatre. In February 1978 Wood was in the Broadway success, Ira Levin's comic thriller Deathtrap, in which he originated the role of Sidney Bruhl, the murderous playwright. Explaining his decision to take the part (a more commercial and contemporary venture than he was normally associated with), Wood told Newsweek, "I just wanted to get onstage in ordinary pants and do one-liners." His performance won the 1978 Outer Critics Circle Outstanding Actor in a Play award. Wood returned to London as Richard III in a 1979 National Theatre production of the Shakespeare play, but his performance received mixed reviews. At the National Theatre at the same time he was also in Arthur Schnitzler's Undiscovered Country, adapted by Stoppard. Wood returned to Broadway in November 1981, taking over from Ian McKellen as Salieri in Peter Shaffer's Amadeus until spring 1982. 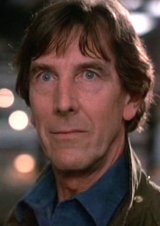 From 1983 and 1986 he acted in a variety of Hollywood films, including WarGames (1983), The Purple Rose of Cairo (1984), Ladyhawke (1985), and Jumpin' Jack Flash (1986). He then played the Player in the 1987 New York revival of Rosencrantz and Guildenstern are Dead. Wood then returned to England and the RSC for three towering roles over the next three years. In 1988 he played an acclaimed and successful Prospero in Nicholas Hyner's production of The Tempest. The critic Irving Wardle said that Wood "lit up the text like an electric storm, and simply had no rival as a source of nervous energy on a stage." Michael Billington wrote that Wood's Prospero "struck me as the best I had ever seen". His Solness in Adrian Noble's 1989 production of Ibsen's The Master Builder was as critically lauded. In the same 1989 RSC season he played Sheridan Whiteside in The Man Who Came to Dinner directed by Gene Saks. His King Lear in Nicholas Hytner's 1990 production was called his "crowning achievement" with one of his most compelling performances, in which he seemed (to Michael Billington) "to reinvent King Lear on the spot". His performance won the Evening Standard award for Best Actor of 1991. In that RSC season, he also played Don Armado in Terry Hands production of Love's Labour's Lost. Thereafter Wood appeared in far fewer plays but returned to playing character roles in TV and films, including Shadowlands (1993), Nicholas Hytner's The Madness of King George (1994) scripted by Alan Bennett, Sabrina (1995) and Ian McKellen's fascist-themed Richard III (1995). He also played Baron de Charlus in the 1997 radio adaptation of Harold Pinter's screenplay of Marcel Proust's A la Recherche du Temps Perdu. In 1994 he played the East End gangster in Philip Ridley's Ghost from a Perfect Place at the Hampstead theatre. Wood returned to the National Theatre in 1997 for Richard Eyre's production of The Invention of Love by Tom Stoppard. Wood played the aging classical scholar and poet A.E. Housman in a role written specifically for him by Stoppard, and for which he received a nomination for an Olivier Award. He played Spooner at the National Theatre in 2001 in Harold Pinter's No Man's Land. He last appeared on stage in 2005 at the National Theatre in both parts of Henry IV. He was supposed to appear in the Robert Altman-directed Resurrection Blues by Arthur Miller at the Old Vic but had to withdraw because of illness. Wood made his last television appearance guesting on Lewis in 2007. Wood was appointed a Commander of the Order of the British Empire in 2007. He was married twice. He had one son, Sebastian, with his first wife, Gillian Neason. With his second wife, Sylvia Vaughan, he had another son and two daughters. John Wood died of natural causes on 6 August 2011. Wood won a Tony Award in 1976 for the role of Henry Carr in Stoppard's Travesties, and was nominated for an Olivier Award in 1997 for the role of A.E. Housman – which he originated – in Stoppard's The Invention of Love. Wood received two other Tony Award nominations: for the role of Sherlock Holmes in a revival of William Gillette's play, and for the role of Guildenstern in Stoppard's Rosencrantz & Guildenstern Are Dead. In 1994 he received much acclaim for his role of Travis Flood in Philip Ridley's controversial play Ghost from a Perfect Place. Wood was appointed a Commander of the Order of the British Empire in the New Year Honours List of 2007. ^ Smilgis, Martha (4 September 1978). "Why Did Broadway's Leading Man, John Wood, Do a Movie with Farrah Fawcett-Majors? 'Money'". People. Retrieved 1 August 2018. ^ Variety Staff (11 August 2011). "Actor John Wood dies at 81: Tony winner known for Shakespeare, Stoppard plays". Variety. Retrieved 1 August 2018. 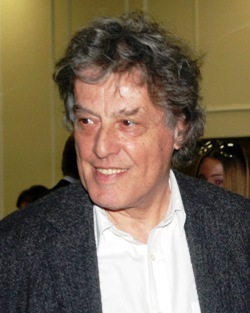 Sir Tom Stoppard is a Czech-born British playwright and screenwriter. He has written prolifically for TV, radio, film and stage, finding prominence with plays such as Arcadia, The Coast of Utopia, Every Good Boy Deserves Favour, Professional Foul, The Real Thing, The Invention of Love, and Rosencrantz and Guildenstern Are Dead. He co-wrote the screenplays for Brazil, The Russia House, and Shakespeare in Love, and has received an Academy Award and four Tony Awards. His work covers the themes of human rights, censorship and political freedom, often delving into the deeper philosophical thematics of society. Stoppard has been a key playwright of the National Theatre and is one of the most internationally performed dramatists of his generation. In 2008, The Daily Telegraph ranked him number 11 in their list of the "100 most powerful people in British culture". Travesties is a 1974 play by Tom Stoppard. The play centres on the figure of Henry Carr, an elderly man who reminisces about Zürich in 1917 during the First World War, and his interactions with James Joyce when he was writing Ulysses, Tristan Tzara during the rise of Dada, and Lenin leading up to the Russian Revolution, all of whom were living in Zürich at that time. Ian William Richardson, was a Scottish actor of film, stage and television. Rosencrantz and Guildenstern are characters in William Shakespeare's tragedy Hamlet. They are childhood friends of Hamlet, summoned by King Claudius to distract the prince from his apparent madness and if possible to ascertain the cause of it. The characters were revived in W. S. Gilbert's satire, Rosencrantz and Guildenstern, and as the alienated heroes of Tom Stoppard's absurdist play, Rosencrantz and Guildenstern Are Dead, which was adapted into a film. Edward Petherbridge is an English actor, writer and artist. Among his many roles, he portrayed Lord Peter Wimsey in the 1987 BBC television adaptations of Dorothy L. Sayers' novels, and Guildenstern in Tom Stoppard's Rosencrantz and Guildenstern Are Dead. At the Royal Shakespeare Company in 1980, he was a memorable Newman Noggs in the company's adaptation of Dickens's The Life and Adventures of Nicholas Nickleby. Simon Russell Beale, CBE is an English actor, author and music historian. American Players Theatre (APT) is a classical theater located just south of Spring Green, Wisconsin. It includes a 1,089-seat outdoor amphitheater. John Arthur Rubinstein is an American actor, Broadway, and television actor, a composer of film and theatre music, and a director in theatre and television. 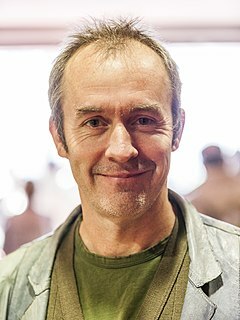 Stephen John Dillane is an English actor. He is best known for his roles as Leonard Woolf in the 2002 film The Hours, Stannis Baratheon in Game of Thrones, and American politician Thomas Jefferson in the 2008 HBO miniseries John Adams, a part which earned him a Primetime Emmy nomination. An experienced stage actor who has been called an "actor's actor", Dillane won a Tony Award for his lead performance in Tom Stoppard's play The Real Thing (2000) and gave critically acclaimed performances in Angels in America (1993), Hamlet (1994), and a one-man Macbeth (2005). His television work has additionally garnered him BAFTA and International Emmy Awards for best actor. Rosencrantz & Guildenstern Are Dead is a 1990 comedy-drama film written and directed by Tom Stoppard based on his play of the same name. Like the play, the film depicts two minor characters from William Shakespeare's play Hamlet, Rosencrantz and Guildenstern, who find themselves on the road to Elsinore Castle at the behest of the King of Denmark.